If you have concerns about how Zillow’s automated valuation model (AVM), Zestimate, could affect sellers’ perceptions of home value, then brace yourself because automated valuations will be a major battleground for portals starting this year. To stay competitive on the Internet, all of the major portals (and perhaps even a couple of the largest franchises) must meet or exceed Zestimate’s functionality — the market will otherwise ignore their portals. Why does the marketplace demand an automatic valuation? Put yourself in the consumer’s shoes: you can see your home’s value and some comparable properties; you can see cool aerial pictures of your neighborhood; you can spy on your neighbors’ values (and rooftops and yards); and best of all, you can do it all without calling a broker. This was all impossible for the average homeowner before Zillow. They love it; they now demand it. But these AVMs that consumers love are also inaccurate. Why is that? The problem starts with the industry’s appraisal model of valuation and becomes more acute as you automate the model with computer programs. Match three homes that are comparable in location, style, size and condition to a subject, and then make dollar adjustments to equalize any inconsistencies — and make sure a trained professional oversees each step. This is the way appraisers, brokers, lenders, investors, the secondary market, economists and Wall Street value a home. But how do you decide the dollar amount to adjust between a home 3,300 square feet in size and another that’s 3,100 square feet? How much do you adjust for the difference between four bedrooms and three bedrooms? These nuances are where the appraisal models start unraveling very quickly, especially when you switch professional judgment for mathematical algorithms. Sometimes the home with the greatest square feet sells for the highest amount, and sometimes the home with the least square feet sells for the most — even after controlling for location, size, style and sale date. 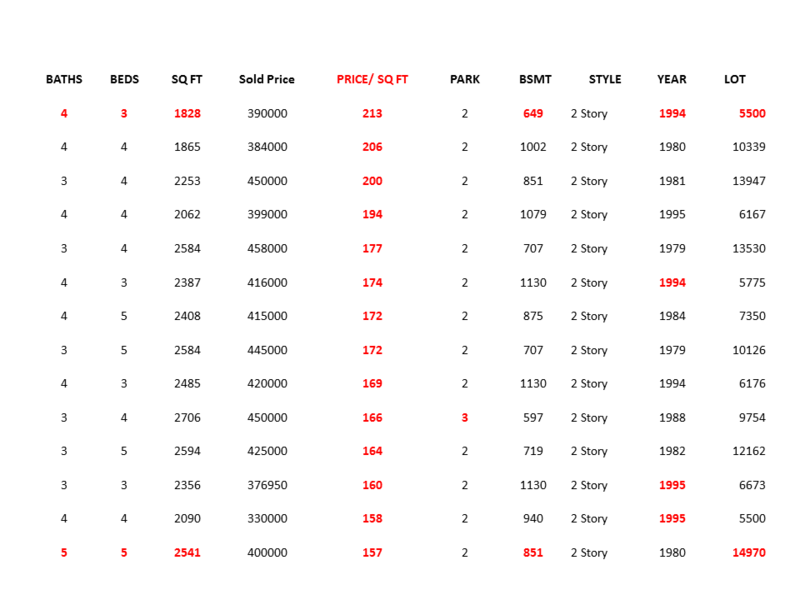 Here’s a spreadsheet of sold properties from the same neighborhood, with all homes selling within six months of each other, all the same style and all within 20 percent of the size of the subject. Note the 36 percent spread from lowest ($157) to highest ($213) values per square foot. See how the square feet size and bedroom and bathroom counts are not consistent with value per foot? Those variances are not easily accounted for by automated systems — and honestly, how humans adjust for them is wrong. If you step away from using your “professional” judgment and analyze sale data using multiple regression, you find that sometimes bedroom count does have a high correlation to value, but other times it has almost no correlation to value. Look again at the spreadsheet. You have the same problem with all eight of the physical characteristics used to make adjustments to value: above-ground size, bedrooms, bathrooms, basement size, percent of basement finished, lot size, garage spaces and year built. At times, each has a high correlation to value; other times, each has little or no correlation to value (see the study). In neighborhoods where there is very low or no correlation to value, you should not make any adjustments to value based on these physical features … but everybody does it anyway. Why this matters to you is the same reason it matters to Zillow: The physical characteristics of each home only account for a percentage of a home’s value, and the correlation with value is inconsistent. When used appropriately, a home’s physical features can give you a base value. The range of potential values for each home is established by what the market desired the most and what they were willing to pay to attain their desires. What the market desired has to do with the home’s form, flow and level of finish. This is what caused the 36 percent spread in values per foot mentioned above. The correlation or impact to value is created by what the marketplace desires the most and what they will pay to attain those desires — which can vary by neighborhood. There’s no consistent correlation between neighborhoods and price ranges. All of this means that when an appraiser automatically makes dollar adjustments for differences in square feet and bedroom count without knowing the multiple regression results for that neighborhood, they are probably doing things wrong. When computer programs try to do the same thing without any professional judgment, it can get ugly. Now, Zestimate is a complex program; it does not try to derive value based on three comparable homes and executing rudimentary dollar adjustments to equalize value. It uses far more sophisticated “random forest regression,” which is more like running a thousand decision tree simulations nearly simultaneously to derive a value. The sophistication of Zestimate’s analysis is not its problem; its problem is that the analysis is built on the wrong premise. Its downfall is that it uses all physical data and does not take into consideration the emotional triggers of each home’s individual form, flow and finish — the real reasons for the range in value that we saw on the spreadsheet. This is why the Zestimate offers a value, but to meet a 95 percent confidence level, Zestimate must also offer a range of values above and below the estimate. That range of values is caused by the form, flow and finish of each home, which the Zestimate ignores. The good news is that, theoretically, AVMs will be more accurate. The bad news (for you) is just as with HAL, if these new AVMs become more and more accurate, the sellers will trust them all the more over the next few years. As the new AVMs are perfected, home sellers will rely on their accuracy and may simply place their homes for sale in portals without brokers. Brokers will still get paid for bringing a buyer to closing, but your current business model of being paid for listing and being paid for selling a home may be gone within five years. This is not to scare you or to appear pessimistic; these scenarios are all strategic alternatives you must consider in your longer-range business plan. Now you know why current AVMs are inaccurate, and you have some idea of how they will improve and how they will eventually affect your business model.